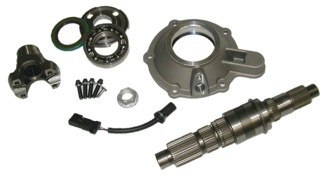 The Heavy Duty SYE (Slip Yoke Eliminator) kit is a highly recommended upgrade to all of the Jeep 231 transfer cases. By replacing the problematic OEM tailhousing and mainshaft with a fixed yoke design 32 spline HD output and Yoke you create a significantly shorter and stronger New Process (later New Venture Gear) 231 transfer case. The Novak Designed 231XS kit, at 7” shorter than stock, is our shortest and strongest design. If you can accommodate the electronic speedometer output this kit is our first recommendation. 1992 and newer Jeeps have this type speedometer. This kit includes the reluctor and sending unit. On earlier Jeeps you will want the optional connector, later TJ versions plug in. If yours is different than shown below, you will need the plug. This SYE kit is 4” shorter than stock and allows the use of a mechanical speedometer or the stock electronic speed sender. Top to bottom, 231XS, 231SYE, stock. A comparison of the three output shafts showing the difference in length. Notice the massive diameter difference on the output side of the shafts. This translates exponentially into strength. The factory NP231 output shaft exhibits a very weak area just behind the oil pump splines. It is not uncommon to see these shafts shear at any one of three stress risers in the section that needs strength most. 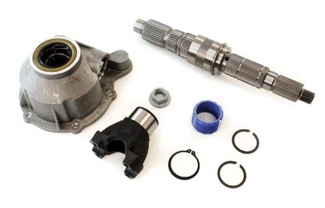 All kits include replacement output shaft, tailhousing, rear seal, bearing, 1310 CV style yoke, hardware, and instructions. Wear in the chain and bearings. For such a compact and lightweight unit, the 231 with SYE in place will handle a substantial amount of power as long as the chain is not stretched and bearings are in good condition. If your transfer case has more than 100K miles on it, is of questionable origin, has been subjected to hard use or you just want to be sure a rebuild with new quality chain is recommended. - This is highly recommended/essential unless you are certain of the current condition of the chain in particular. A wide chain and sprockets kit adds 25% more strength in that area by increasing the width of the chain from 1” to 1-1/4”. - This is usually overkill. If you want to go above and beyond on the strength the low range planetary can be upgraded from 3 to 6 gears. This doubles the contact area and substantially increases the strength in that area. - This is usually overkill. 231XS is electronic speedometer output only. It is so short there is not room for a speedometer drive gear assembly. It will work on all year 231 transfer cases but will only output a 3 pulse per rotation, 3 wire square wave speed signal which is what the 1992 and newer Jeep uses. Any speed adjustment will need to be done with an external adjuster box as listed below or in the speedometer itself. 231SYE-1 uses the stock speedometer sending unit on all year Jeeps. It will work with any Jeep 231 transfer case not requiring the vacuum disconnect switch commonly used on early XJ Jeeps. You can use this kit on those Jeeps when eliminating the vacuum disconnect switch. 231SYE-2 uses the stock speedometer sending unit on all year Jeeps. It will work with Jeep 231 transfer cases that require the vacuum disconnect switch commonly used on early XJ Jeeps. The NP/NVG input gears are divided early and late about 1993-1994. However there are no guarantees that things are original or that the change was made as a clean break 93 down and 94 up. If in question, the input bearing width on these models is a good indicator. “E” Early uses a 24mm wide bearing and “L” late is 16mm wide. The photos above show the differences in width of the bearing location and the stepped shoulder between the bearing and the gear. The 241JK transfer case is a special case requiring special gears. It is a late cut with additional machining required. This box allows your speed signal to be adjusted for tire size and gear ratio for accurate speedometer reading. It also allows the Jeep 3 wire square wave signal to be simultaneously sent as a 2 wire sine wave for your GM engine PCM on a manual transmission application. The GM PCM will need to be programmed to accept a 8,000 pulse per mile signal. Driveshaft length changes are often required. Most conversions to these transmissions will require that the rear driveshaft be modified to be shorter and front driveshaft longer. Some of our customers, fearful at the perceived expense of new or modified driveshafts, attempt to let the existing driveshafts dictate engine, transmission and transfer case location, usually to the detriment of the project. Our recommendation is to always value the correct position of drivetrain components over saving a few dollars which is usually regretted in the long run with compromised positioning. Sometimes the application allows use of the existing shafts without modification. While that is perfectly acceptable, it should not be the first priority. Driveshaft modifications and rebalancing can be affordable when performed by driveline, RV or tractor implement specialists. 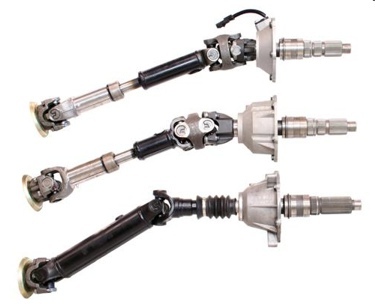 New driveshafts are an option, but not necessarily a requirement in regards to the actual successful conversion if your existing driveshafts are in good condition. Jeeps that require extensive travel or specialty-built driveshafts have this option available through several fabricators across the nation. These are normally specified after placement of the new transmission and measured at vehicle ride height. As the rear driveline gets shorter, it is often advantageous to us a Double Cardan or “CV style” rear shaft with the correct geometry at the axle to minimize vibrations and possible binding. Novak can also accommodate your needs on this if provided with dimensions for the shafts at a reasonable rate. Use of factory axles is completely acceptable with this conversion. Axle upgrades are not necessary, but they may be chosen for reasons external to this transmission upgrade. All versions require removal of the old tailhousing and output shaft and installation of the new components. Normal mechanical tools are required as well as RTV to re-seal the case halves. Often a rebuild is performed at the same time with new chain and bearings as you are already halfway there. A new rear driveshaft with Double Cardan/CV style upper joint is required and will be longer than the previous shaft and at a lower angle. Often if you have dropped your transfer case in an effort to minimize angle of the rear shaft, the lowering kit can now be removed due to decreased angularity from both length and the fact that the upper angle is now split between two joints. Proper installation is to have the rear pinion yoke a few degrees below pointed directly at the transfer case. You will want to rotate your rear axle accordingly. If you provide us the center of yoke to center of yoke distance we can supply the rear shaft for you as shown above.